Slow cooker apple dessert is just that – a dessert. It isn’t a cobbler, cake or cookie. Just a nice fruity spicy snack or a not too sweet ending to a meal. This is a perfect dessert to make when you are working on a project at home because it makes the house smell amazing. Wouldn’t want to waste that cinnamon odor!!! The dessert goes together really quickly! Pop it in the crockpot and do what you need to do! Dessert will be ready and waiting for you! The amount of chopped apple does not have to be precise. More apples just means the dessert will be more moist. Depending on your crockpot, check at 2 and a half hours just to make sure that the dessert is not browning too quickly. It is good warm or cold – my preference is cold because the flavors meld. Don’t skip the topping because the cold, creamy smoothness really makes the other flavors shine! 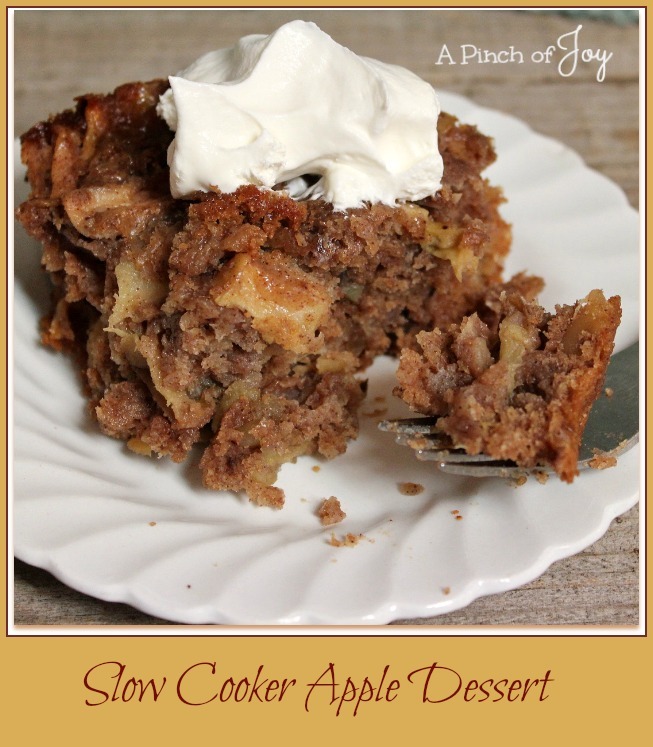 Delightful cinnamon spicy apple cake baked in the slowcooker. Mix flour, sugar, baking powder cinnamon and salt in mixing bowl. Add apples to flour mixture, coating apples lightly. In small bowl, mix eggs and vanilla. Add to apple mixture and stir until just moistened. Spray crockpot insert with cooking spray and spoon apple mixture into crockpot. Cover and bake on high about 3 hours. Sounds delicious, and I can make it in a slow cooker?? I am all for that! Heading over to share on G+!